8/4/09 – Museum – Louvre Abou Dhabi – France-Muséums has just started acquiring works for the Abou Dhabi museum and there are already signs of a conflict of interest with French museums, ultimately settled to the detriment of the latter. Thus, it has not taken long for our direst predictions to come true. Abou Dhabi received one of the three Piet Mondrian paintings auctioned at the Bergé sale. Yet, there is no Mondrian from this date (around 1920) at Beaubourg and many people thought that the Musée National d’Art Moderne would try to pre-empt one. Withdrawing one of these canvases from the market makes it even more improbable for Beaubourg to acquire a painting from this date in the future. We must admit however that these three works had been acquired less than thirty years ago on the international market and that the export ban could not be applied in their case. As Beaubourg was interested in the Chirico painting, it did not have the means to bid for the Mondrian. 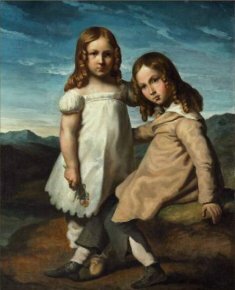 The real problem, though, is the Géricault painting, the Double Portrait of the Dedreux Children, about which we wrote extensively on this site explaining that this was a major loss for French heritage (see news item of 24/2/09). We were surprised that the Louvre had not put it up for listing as a national treasure. The reason for this is very simple : there is already a long list of national treasures waiting to be acquired. The total value represents a significant sum and the Louvre does not have enough funds to purchase them all. This is understandable, although the pertinence of certain choices or the price of some objects might be questionable but, even so, we regret that the manna from Abou Dhabi cannot be applied towards these acquisitions. Furthermore, the Louvre is not the only museum in France. Rouen, and especially Lyon were also interested in acquiring it. Although they did not have the means to make such a purchase now, the 30 months’ delay accorded in the case of a national treasure could have been respected in the hopes of raising the funds . France-Muséums did indeed inform the Louvre that it was interested in the Géricault painting and would step aside if the Louvre intended to pre-empt it. The museum confirmed that it would not try to do so, for lack of money. And France-Muséums then went ahead and made its bid at the auction ! The canvas went finally to Alain Tarica, an art dealer acting for a private collector, only because the French agency had not foreseen how high the price would go. Of course, Pierre Bergé’s direct appeal to the French President would have preventeded the listing anyway, as was the case for the other two works suggested for this category (see news item of 2/3/09). But this is a totally different story.